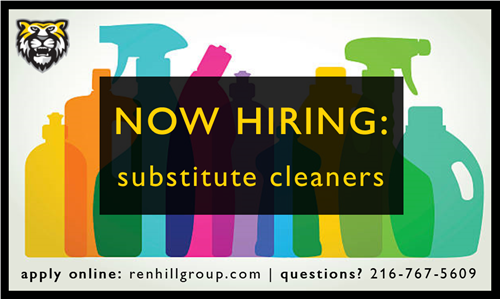 Sept. 11, 2018 -- The CH-UH City School District and its staffing partner, Renhill, are hiring substitute cleaners for the 2018-2019 school year. This position is on call and as needed throughout the 12-month calendar year. Qualified candidates must be able to provide verifiable previous experience in cleaning/maintenance, as well as demonstrate knowledge of basic safe practices and sanitary cleaning procedures. Visit Renhill's online job description for more information and an application link.